Since its introduction at the very beginning of Mechanics Made Easy, this is another of the small set of parts included in every single Meccano outfit ever made. It's also by far the most common Meccano part, other than nuts and bolts. In my opinion it contains the single genius idea that allowed Meccano to be successful -- the elongated hole in one side, notionally for 'adjustment'. In the days before angle girders, the angle bracket was needed to turn strips into structural girders. And because the MME strips were so thick, once you had three or more strips bolted together you needed the slack in the elongated hole to make parts fit. But, because the elongated holes in the angle bracket were carried on to the angle girder, this flexibility allowed huge structures to be built which would be almost impossible if the bracket had had normal holes on each side. The photo above shows the whole range of variations. Initially the MME version of this part had square ends, changing to the rounded tin-plate version next to it in around 1907. These are found in outfits up to as late as 1911, but from there on they were nickel-plated. The green Mechanised Army angle bracket shown in the centre above is the only time the angle brackets were painted. The special thicker clock kit version (far right) is not part 12, it was given the new part number 266, but is included here as it is almost identical. The first "Meccano" angle brackets, the tin-plate rounded variety, are considerably thicker than later versions, approximately 0.9mm thick (0.035'' / 20 gauge), and are the second in the photograph above. From 1911, the nickel-plated variety was initially around 0.75mm (0.030'' / around 22 gauge plus nickel plating), as per the third example. Later pre-war angle brackets were thinner, and stamped Meccano. These dropped to around 0.65mm (0.025'' / 23 gauge), and are shown fourth in the above photograph. 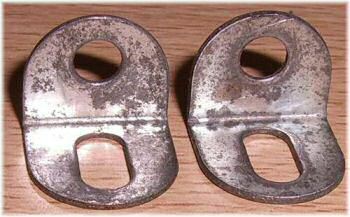 The 'economy' versions during the Korean war can be even thinner, but on average the angle bracket remained this size post-war, and the zinc-plated versions from 1966 onwards are similar too. The only exception is the special hardened angle brackets included in the Clock Kit 2 for controlling the striking mechanism. Standard angle brackets are too thin and tend to bend in this application, so a special set of blackened steel hardened ones were supplied, around 0.81mm thick (0.032'' / 21 gauge). The photo to the right shows two of the angle brackets supplied in a later version of the Clock Kit 2 (the kit had hex nuts), and both of these are zinc plated. Note that the one on the left is thinner, like the standard part 12, and the one on the right is thicker and part 266. Zinc plated hardened angle brackets are not commonly known, and these may well have been a simple mistake, along with the packaging of a standard thinner angle bracket. Has anyone else seen these in a Clock Kit? The box to the right shows a dealer spare parts box of a dozen angle brackets, part 12. 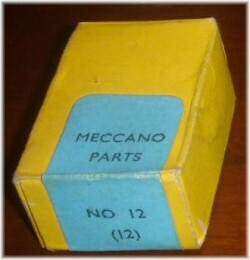 The blue label on the parts box is believed to have been used from 1964 (after the takeover of Meccano by Lines Bros), through to about 1970 when the label changed to white. These angle brackets are therefore probably zinc plated. Hi. We have a brand new Meccano super construction set - 25 models and it's missing two of part 12. We found it on your site. Can we please order two of these silver pieces? Space sets give the Angle Bracket part No 481 instead of 12. I've never seen one, but this usually means there's a colour difference...So what colour are 481 in Space sets? Long time to get an answer, but most Meccano parts (ordinary strips, fisplates, and these) are 1/2", 0.5", or 12.7mm wide. I am afraid I am not used to Meccano products, can you tell me the size of these brackets in mm (they appear to be approximately 20mm by 20mm?). Thank you. Seeing your update made me read this page and notice a discrepancy ? My No 2 clock, (a later one as is has hex nuts) has all zinc plated angle brackets. It has both the thick (.031) and thin (.025) types mixed. Maybe this is why Meccano changed to blackened so they could sort them out ? Thanks for the fun site ! Reply: Hi Michael, thanks for that. I've installed your picture on the page. This can't have been an early version because as you say your outfit has hex nuts. Blackened steel part 226's are the only ones known apart from yours, so far!